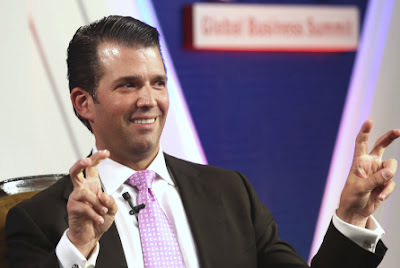 Donald Trump Jr. and Charlie Kirk are discussing with major publishers a book, according to the Daily Beast. The 24-year-old Kirk, who would obviously pen the book, is the founder of Turning Point USA, whose stated mission is "to educate students about the importance of fiscal responsibility, free markets, and limited government." The organization also maintains a Professor Watchlist that lists college professors it alleges discriminate against conservative students and advance "leftist propaganda" in the classroom. The organization is also a very strong supporter of President Trump. It is currently sponsoring "a highly-subsidized" educational trip to Israel for conservative activists. NewsMax has ranked Kirk as the seventh most influential Republican under 30 years of age. Wants to educate students about free markets and limited government... and is a strong supporter of Trump? I wonder who drew the pictures. Is the trip to Israel like a safari, except instead of big game you get to trophy hunt Palestinians?